For information about our upcoming events, check this page and our weekly newsletters! The North Carolina Chapter of the Public Relations Society of America (NCPRSA) will host its annual meeting on Wednesday, Dec. 5, at the N.C. State University Club’s State Room from 8:00 am – 10:00 am. In addition to hearing chapter highlights for the year, attendees will meet the new board directors and officers for 2019. The winner of the 2018 Michael L. Herman Excellence in Mentoring Award will also be announced. The keynote speaker is Alice Garland, who recently retired as executive director of one of the state’s top sales and marketing organizations, the N.C. Education Lottery. Under Alice’s leadership, the Education Lottery grew into a $2.6 billion brand, providing fun for a good cause. Alice’s talk, “Do The Right Thing, Tell The Right Story,” will share insights on how the lottery won public support for its mission through corporate social responsibility and used storytelling in its advertising, marketing and public relations to raise awareness across North Carolina of its brand purpose. Today, this purpose-driven brand raises more than $650 million a year for education in North Carolina. Alice helped start the Education Lottery and served as its executive director for 7.5 years. She became a leader in the lottery industry in the United States, highly regarded for her work in the area of responsible gaming. In July 2016, she became the first gaming industry professional to receive a top award from the National Council on Problem Gambling for her leadership expanding responsible gaming efforts across the United States. For more than 36 years, Garland served in executive posts handling governmental affairs and communications, including positions as assistant secretary for communications and external affairs with the N.C. Department of Commerce; director of public affairs for ElectriCities of North Carolina; and Director of Policy for the State Employees Association of North Carolina. Garland received a bachelor’s degree from the College of William and Mary with a major in urban studies and a minor in economics and a master’s degree in city and regional planning from the University of North Carolina at Chapel Hill. She currently serves on the board of directors of the State Employees Credit Union. 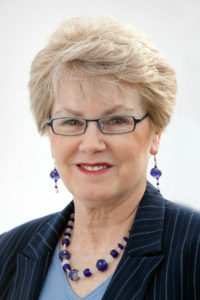 She lives in Raleigh with her husband, Mike Davis, APR, of Mike Davis Public Relations, and a longtime member of PRSA. For NCPRSA events (professional development, networking, skills, etc. ), no refunds will be issued if the event is postponed by the Chapter due to an act of nature (snow, hurricane, etc.). If the Chapter cancels the event, refunds in full will be made as soon as feasible. If for some reason you are unable to attend an event for which you registered and paid, no refund will be issued, so we encourage you to transfer your registration to another professional.